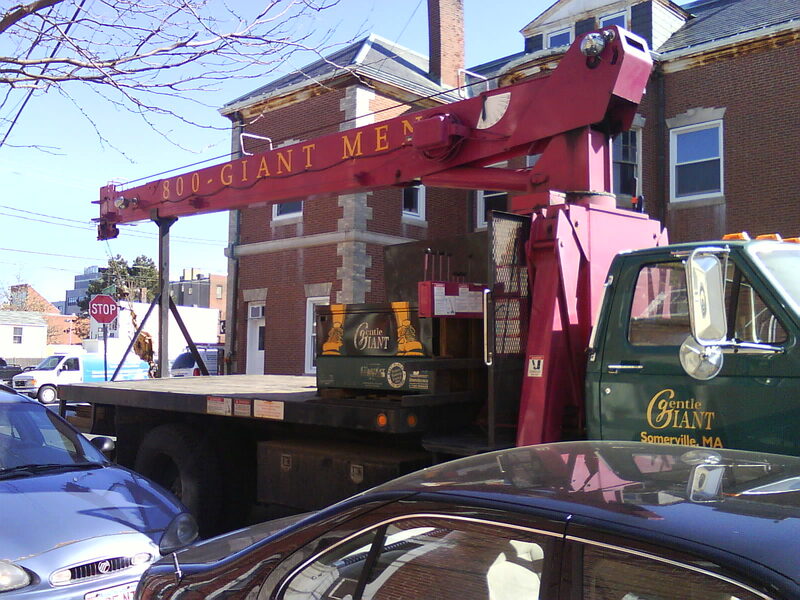 We were on our way home from taking Thumbelina to the vet* yesterday when I spotted a couple of guys from Gentle Giant on Binney Street in Cambridge in the middle of a move. Rerun was in my lap and I pointed them out to him and we waved in our typical dorky “I have a dachshund in my lap “way. It was then that I was reminded that I’d promised the Gentle Giant folks that I would post these pictures. You see, Gentle Giant is the only moving company that I trust to move our antiques, jewelry, crystal, silver, etc. They regularly get top ratings from the BBB and other groups, and they’re the only moving company I’ve ever heard of that has employees who’ve been there for decades. Also, I once used them for a move and a sterling bracelet fell out of my jewelry box into the van. I would never have known it was gone, or at least not for a while. One of the guys found it in the van and walked up to me and handed it to me. That earned my respect and my business. Anyway, the Gentle Giant folks set up a tent at Brimfield every year for two reasons. One is to sell off some stuff, however this is a very minor reason. The HUGE reason they’re there is because in addition to moving services they also offer expert furniture restoration services. I’ve met the woman who runs the department and I’ve seen the work they do and it is outstanding. This year we stopped in to chat with the guys in the tent and to tell them how they’re the only moving company we’ll ever use and to see the restored objects they had. We had a great time talking. 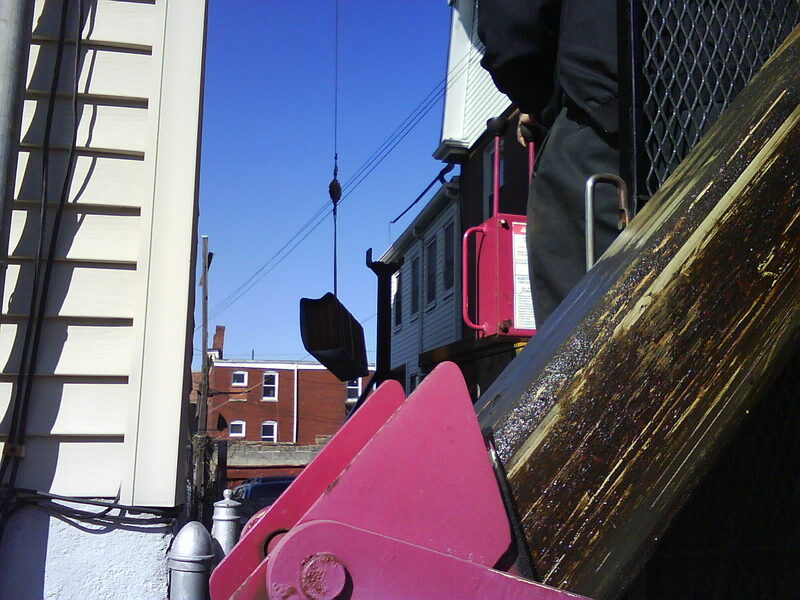 I mentioned how in my last move they had to bring the crane (seriously, they have a crane for urban moves where some things don’t fit down stairs or through doors, etc.) and our two mahogany armoires and our couch had been flying through the air. 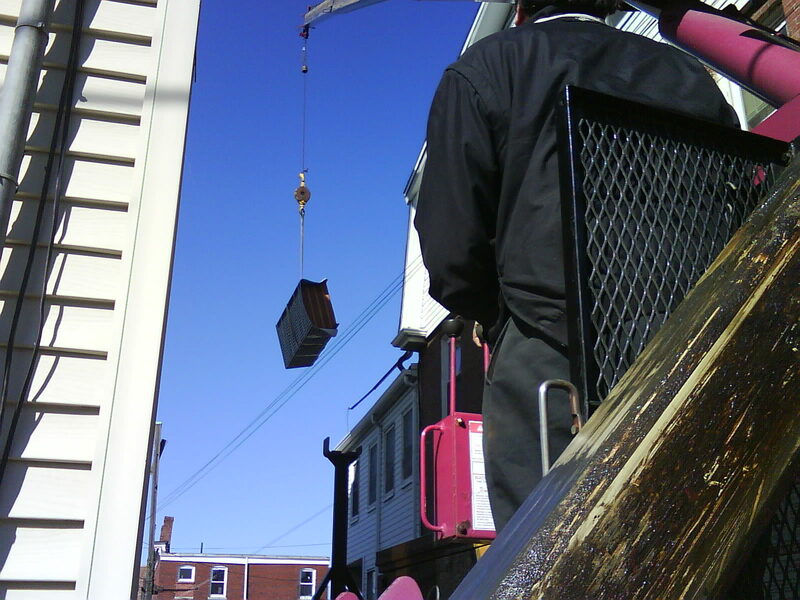 I told them how impressed I was with the crane operator and the two guys on the moving crew who moved the stuff once it was on the ground. I mentioned how I had taken pictures and they said that I should make sure to send along the photos to them as they loved to see that stuff. I said I would but with all the hustle and bustle of Brimfield, I completely forgot until I saw the Gentle Giant guys working yesterday. So, without further ado, here are my flying furniture pictures. 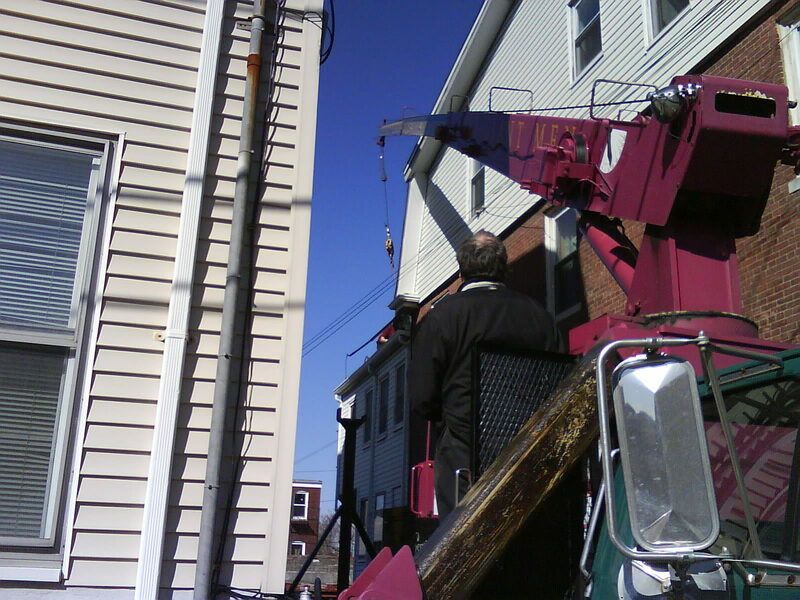 A closeup of the crane before the driver backed it into the driveway. 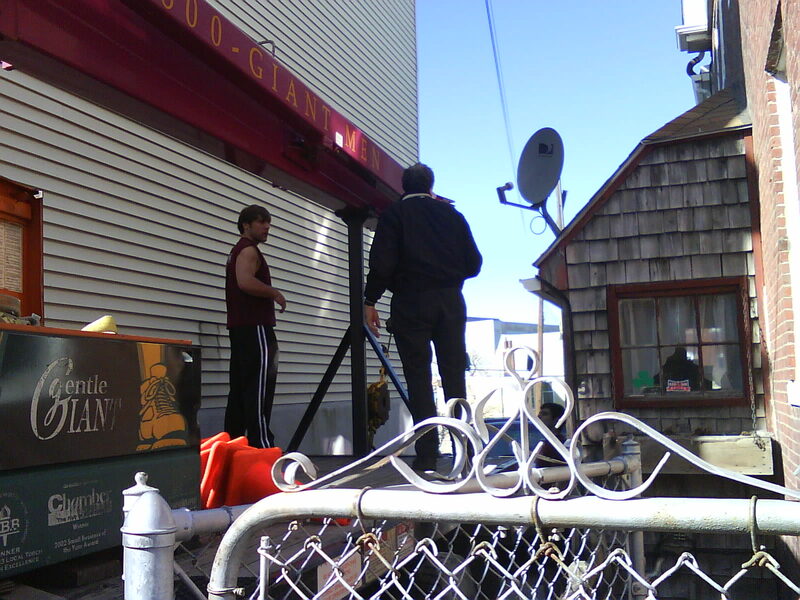 The crane backed into the driveway. The driver did an amazing job. I should take a moment to mention here that the driveway at our old place was extremely narrow and was between our building and the one next door. 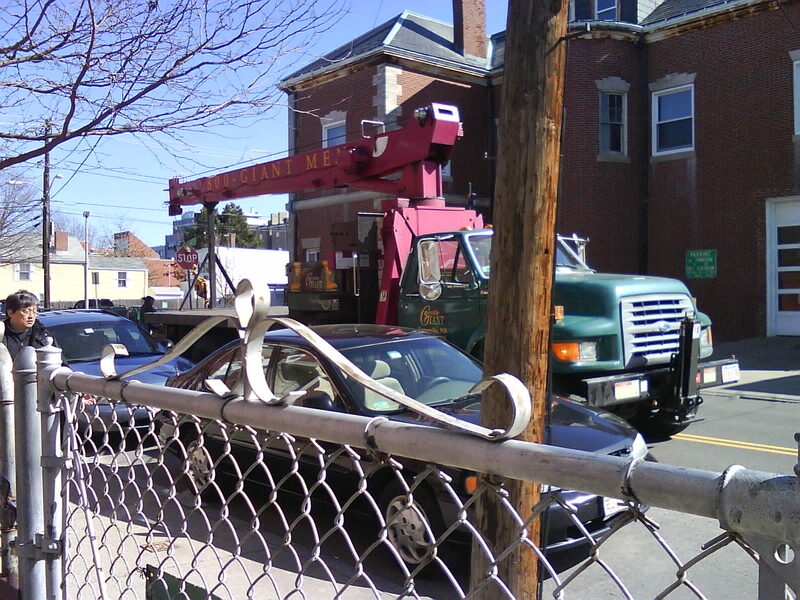 The crane had about 6 inches of clearance on each side and the crane driver/operator moved it into place without bumping into either building, the fence, anything. It was amazing. 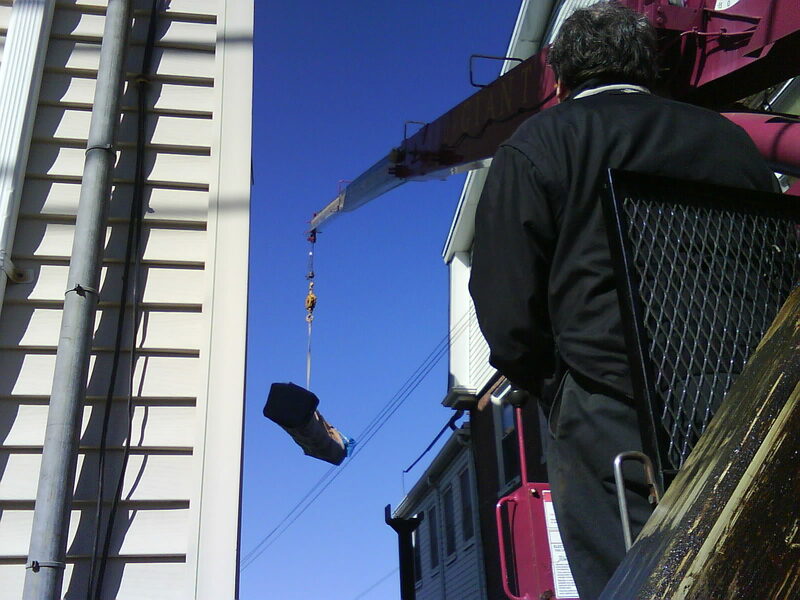 The crane heads up to the back of the 3rd story where our furniture waited along with the movers. The couch is in the air. He had to navigate not only the narrow space but also the wires in the air and the SUV on the ground that my landlady had forgotten to move. The couch landed safely. Mahogany armoire the second comes in for a landing. And those are the photos. I am, in fact, sitting on that very couch now as I type this. I hope you enjoyed the pictures of the flying furniture. * Thumbelina had to go to the vet because at the end of last week she and Bucky got in a skirmish. That in and of itself isn’t unusual, the two of them have issues over who’s the boss of, for instance, the bed, all the time. This time, however, they got into it on the stairs and we think he knocked her down a stair or two. She’d been a little off since it happened and when I picked her up on Saturday night she actually squeaked in pain. That meant that Monday morning we called the vet. They fit her in on Tuesday and, after a full physical and check of her spine, neck flexibility, and her leg joints she was declared OK. Bucky bruised her but didn’t hurt her in a permanent way so she was sent home with some doggie anti-inflammatories. She’s back to her old self already.